Our family received some very happy health news about Cameron's Grandma Mary El len this week! Cam adores seeing his Grandma on a weekly basis. She has taught him so many musical things- playing the piano, ringing bells, and practicing conducting. Cam loves hearing his Grandma sing songs and read books. She can always make him laugh and giggle! 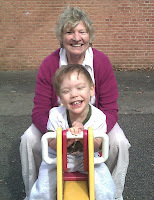 Besides all of the playtime and walks, Cam & Grandma play plenty of learning games too. She is constantly encouraging him to say new words and understand new concepts. We cannot thank Grandma enough for being such an integral part of our lives and bringing such joy to Cam's life and that's why this week's blog is dedicated to her! !